Community-Based mentoring helps ignite the brightest possibles futures for youth. They involve one-on-one outings and activities that both the Big and Little are interested in out in the community. Meet 2 – 4 times a month with your little for a minimum 1 year commitment. PureGrit Bigs is a community-based program that provides mentoring relationships with caring, responsive adults, with a focus on building resilience. We know we can do more to positively affect youth resilience. PureGrit Bigs are responsive mentors who are committed to ongoing training and implementation of tools to create a more resilient youth through connection and skill building. Our part: We’ll connect with you, once a month, to ensure you and your little are forming a strong bond. We’ll also host, in-house meet ups to talk, with you, and other PureGrit Bigs about relationship building and building skills in youth. Additionally, we’ll send out short videos each month to help you learn and build more skills as a mentor. Outdoor Bigs is a community-based program that provides mentoring relationships with caring, responsive adults which empower youth to achieve their brightest possible future. Though there are many proven benefits to youth who get outside for recreation and play, we also know that youth are spending less and less time outdoors. Outdoor Bigs are paired with youth who want to get outside, but simply lack the mentor to take them hiking, fishing, canoeing, cycling and hunting. Together, through mentorship, we can connect more youth to the outdoors and experience the wonders our area has to offer. Our Part: We’ll plan and host outdoor meetups for you and your little. Also, we partner with lots of great groups to put on meaningful outdoor recreation and adventure for you and your little. Faith-Based Bigs is a community-based program that provides mentoring relationships with caring, responsive adults can empower youth to ignite their biggest possible future.  Big Brothers Big Sisters of the 7 Rivers Region partners with local faith organizations to provide children of our community with “Faith-based Bigs”. These Bigs are made available to families that are seeking a faith-based influence in the life of their child. Site-Based Bigs help a child realize their full potential at school or another site based location. Kids enjoy having their Bigs meet with them there, whether it’s in the classroom or on the playground or at a club. Meet 2 – 4 times a month with your little for a minimum 1 year commitment. Site-Based Plus mentoring is a blend of community-based and site-based, primarily meeting at the school or other site but have the option to attend BBBS and community activities outside of the site once you and your little feel connected. Meet 2 – 4 times a month with your little for a minimum 1 year commitment.